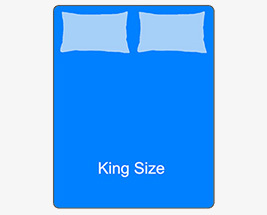 Our range of duvets & duvet protectors for King size beds vary from Home Wash Panel Duvets, to Waterproof and Wipe Clean products. We also offer a range of different materials, togs, duvet fillings and features. If you're looking for extra security during the night, we also offer a range of Pillow Protectors, and King size bed Mattress Protectors.